Hi all! WOW its been busy around here! I am now back to work so no more free days for crafty things! I still have to find some time to clear off the dining room table so we can eat off of it again. I'm sure Mike will be happy when that happens! LOL! So, its just a really simple box template I found online; I cut it out of orange CS and stamped it with the large swirl from SU's Baroque Motifs set. I punched a couple of holes in the top and tied green ribbons on them. 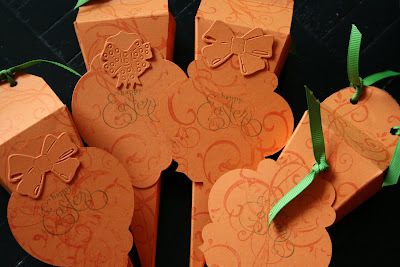 The tags are cut out with a cuttlebug die and I used the Happy Easter stamp from SU's Well Scripted set. Hope you're all having a fabulous Easter Weekend! Super cute & totally fun, Kare! The kiddos will love them (and if they don't, then send 'em to me! LOL!). Hope you have a blessed Easter and congrats again on the new gig! Oh, what an adorable Easter gift box! 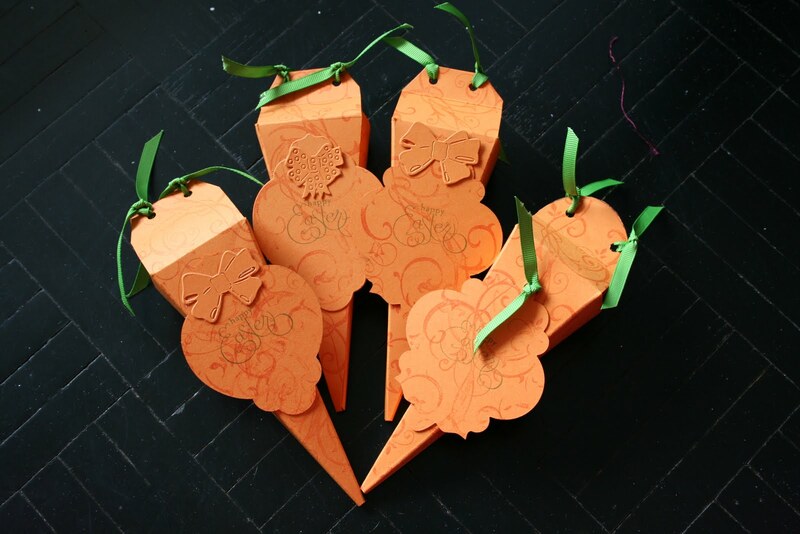 These are the cutest little carrots I've ever seen, and such a special and fantastic way to treat the kiddos! I love those little tags, too! Happy Easter to you, your sweetie, and your families! These are AWESOME!! And they totally look like carrots! You're sooo smart! Such a cool idea...I think I'll "borrow" it. :) MUAH! Karen these are a fabulous idea! I love the shape of them and they definitely look like carrots.